From thatgamecompany, the developer behind PSN’s Flower, a private beta glimpse at an upcoming downloadable title was a tease. 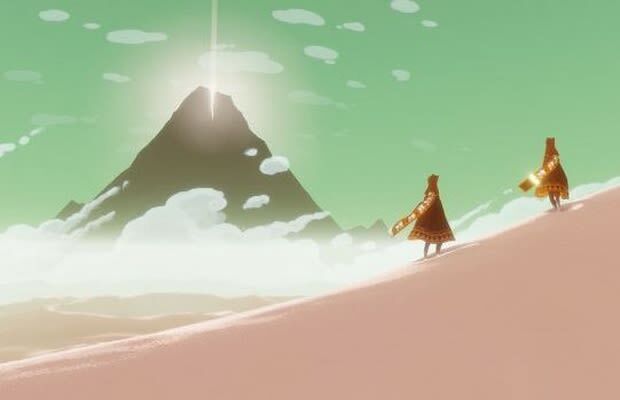 Journey follows an unnamed, crimson-hooded protagonist on a… let’s say “quest” through a lonely desert towards a pillar of mountain light. It’s as experiential and mysterious as thatgamecompany’s previous offering, but incorporates player-to-player voluntary online interactions in a way no game has attempted before. Presumably, the beta was to test the online cooperative functionality, where players wandering between monolithic rock bridges are joined by another unknown protagonist. They look identical and share the same powers: to sing at cloth and jump. Aside from boosting a partner’s jump, there’s little probative benefit to accompanying another lonely wanderer. Instead, players naturally gravitate towards each other out of an innate desire to share the experience. At least, that’s the hope of Jenova Chen and his team at thatgamecompany, and if the beta is any indication, then this serene title will be bringing gamers peacefully together in spring 2012.